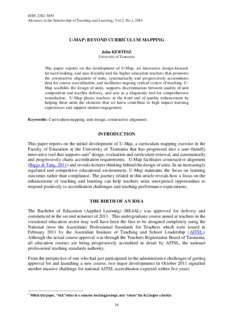 This paper reports on the development of U-Map, an innovative design-focused, forward looking, and user-friendly tool for higher education teachers that promotes the constructive alignment of units, systematically and progressively accumulates data for course accreditation, and facilitates ongoing critical review of teaching. UMap scaffolds the design of units, supports discrimination between quality of unit composition and teacher delivery, and acts as a diagnostic tool for comprehensive remediation. U-Map places teachers at the front end of quality enhancement by helping them unite the elements that we know contribute to high impact learning experiences and support student engagement.